With the silly season behind us, now’s the time to devote some effort to ensuring you don’t miss any opportunities in 2015. Regardless of your industry, and whether you’re in sales, client relationships, a business owner, or new to the working world, LinkedIn is a very good networking tool to help you achieve your professional goals. Unlike Facebook, where profiles are more suitable for personal networking rather than a professional one, LinkedIn encourages users to provide a highly professional look to their resume and/or profile. Here are a few tips to help you create a professional and dynamic LinkedIn profile. Examples of bad, and good, Linkedin profile pics. One of the biggest mistakes on LinkedIn is not using a profile picture, with research showing you’re up to seven times more likely to have your profile viewed if you have one. Like a house or car that’s for sale, the assumption is that if there’s no photo, then something must be wrong. Think about a networking event. You leave with a handful of business cards and intend to follow up on LinkedIn, however it’s much harder for you to remember who’s who without pictures, and vice versa. A missing photo can easily result in a prospective client refusing your request to connect, thus leading to missed opportunities. Are you using the wrong profile picture? Your LinkedIn Profile Picture is meant to represent your professional (not personal) best. The platform is now being used for many forms of business research, and your appearance should represent your professionalism to colleagues, prospective clients, partners and future employers. • Use a professional photographer where possible, or have a head shot taken of yourself in business attire with a neutral background. Communicate great posture, open your eyes, and smile. • Don’t worry about age discrimination. If you use a picture that looks different to your current appearance, instead of listening to you, the client, or interviewer will think you’re deceptive. • Don’t think social. Therefore, NO dog, NO partners, NO baby and most importantly, NO alcohol. Ask yourself, who would you connect with? Most users will spend a lot of time and energy into getting a 100% profile completeness, by meticulously filling in previous employment, education, and specialties before feeling their profile is ready to be launched in the business world. However, one field is often overlooked; the headline. Your LinkedIn Headline is critical, as it’s the only customisable information your colleagues, partners, prospective clients and employers will see of you in Listings, Group Discussions and Home Feeds. When you appear in search results, your Name, Location and Headline will be the three visible pieces of information. If you don’t change your headline manually, it will default to your Job Title and Company. Don’t worry if you haven’t been using this functionality, as it’s actually very easy to get this wrong, and many do. We often promote our company brand standards, however it can be a strange thing for an individual to promote their personal brand. 1. Value Proposition – How do you provide value? 2. Target Audience – For whom do you provide value, and who will read this? It’s not always the end customer that is the decision maker. 3. Unique Selling Point – You’re likely to be stacked up against your competitors, so better you have a headline that really stands out. 4. Keywords – What are the keywords that you think people will search for in your industry? The more specific the better. 5. Be memorable. Your greatest challenge online is to be remembered, so ensure your headline sticks with the people that matter. 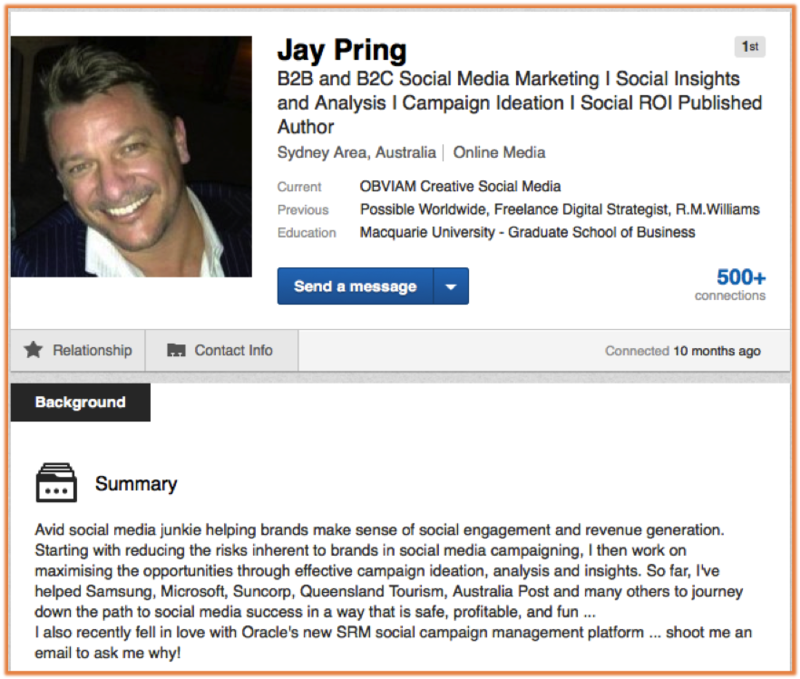 My Linkedin profile is an example of how to optimise your profile. Feel free to connect to me. Writing a good LinkedIn Summary can make all the difference when someone is assessing your profile. If it’s easy to understand where you’re coming from, and the direction your career is headed, it will encourage likeminded individuals to connect with you in business, especially if there are similarities in your ambition as a professionals. Most importantly, it gives the reader a quick overview of who you are and what you can do for them, which is critical when connecting with prospective clients or business partners. No-one is going to scroll down and scrutinise every position you’ve ever had, or take their time to deduce what skills you possess by looking at your groups and associations. This is your chance to stand out, and entice the reader to think they need to take action and speak with you pronto. • Be kept brief and to the point at hand. (Note: This can be a contentious issue amongst professionals, so ask yourself how much you want to read when researching possible connections). • Summarise who you are and what you do in your Current Role. • Describe what you can do for others and why people should engage with you. • List key achievements, or high profile client success, and quantify these as much as possible. • Constantly evolve in conjunction with new product launches, specialties or particular campaign activity. (Remember if you’re trying to engage clients, make sure your summary reflects what you’re selling).